I contacted Nicholas and hired a Limo that would seat 4 people for the “Best of Rhodes” private tour that would take us along the East Coast of the Island to Lindos. 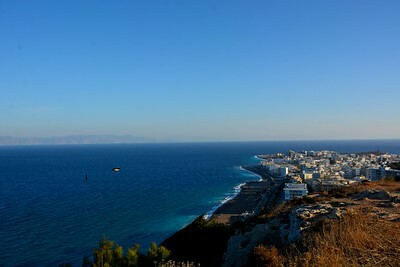 The tour was also extended to include a visit to the Ancient Acropolis of Ialyssos. Lo & behold, our group of 4 grew in popularity and size and at last count we had 4 private limos with 16 people. Each car had their own driver/guide; Sergio, Kostas, Maneul, and Stathis. So although we had 16 people, it was a very personalized experience for each car. We were picked up promptly at 08:30 am and our caravan of four limos whisked off for a 6-hour tour. 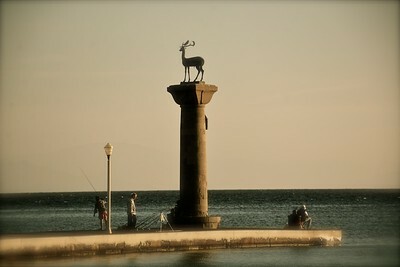 We first stopped at the entrance of the old harbour, where atop tall columns stand two bronze deer which are characteristic landmarks of the island. According to tradition, this was the place where the famous Colossus of Rhodes (one of the seven wonders of the ancient world), once stood. We then proceeded to the Church of the Annunciation which is plain on the exterior, but once you enter you are amazed by the gothic wall paintings (by Fotis Kontoglou) and exquisite chandeliers. Today, this church is the town’s cathedral. After a short visit to the Old Harbour, we continued up the hillside to the Acropolis of Rhodes City which overlooks the city. Beautiful panoramic views of both the new and old towns of Rhodes. Following the stop to take beautiful photos of the coast line and the views of the towns, we proceeded to the Temple of Apollo which features a restored ancient stadium and Greek theatre. After an excellent visit to the Temple of Apollo, the caravan proceeded towards Lindos (our most southerly destination). As we crossed the island from west to east, we made as short stop in the middle at a family-owned ceramics factory, where we observed Father & Son create ceramic pieces and then we were able to shop in their store that had gorgeous hand made/painted pieces of work for sale. The son had developed his own style of “greek architecture” (houses and churches) in which he had won rewards for. I purchased one of his pieces of work for our travel room, it was the perfect souvenir from Rhodes! As we approached the town of Lindos, we experienced a beautiful scenic drive along the east coast of the island, passing picturesque little villages amongst a landscape of orange and olive tress. The Acropolis soon came into view with the village of Lindos situated in the bay of St. Paul’s below. Stunning scenery! Our limos were able to take us right into the Village (vs. tour buses that must park above the Village and walk down). Anthony & I then took the Lindos “Taxi” – aka Donkey ride for 5 Euros each to transport us up to the heights of the Acropolis. We did not enter the Acropolis itself, but we walked around the base of the fortress to take in very beautiful views. We then walked down the steps back to Lindos Village, where we did a bit of shopping, before meeting our driver to take us to our next stop. After Lindos, our caravan then proceeded to the Ancient Acropolis of Ialyssos. We returned to the west coast where we traversed a winding road up to Filerimos Mountain, where we came upon the ruins of the ancient Acropolis. The plateau of Filerimos rises nearly 1,000 feet above sea level. At this location is the Church of Our Lady, built upon the foundations of the ancient temple of Athena. 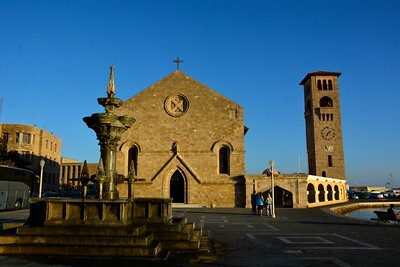 As well, we could see the exterior of a Monastery and its courtyard. Finally, la piece de resistance! 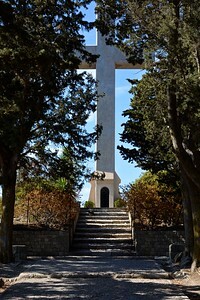 a beautiful tree sheltered pathway, the “Way of the Cross” that has a series of shrines with relief scenes of the Passion, that eventually leads you to the main square to the west edge of the plateau to the 16m (48 ft) cross. At this point, you are again offered stunning views of Rhodes Island. It should be noted that the regular “Best of Rhodes – East Coast” tour usually ends with Lindos, but we added the Acropolis if Ialyssos on to the Best Of tour, as an extra hour. It was well worth it and a great finale to the day. However! the day was not quite over yet! Our drivers dropped us off at the city gates of the Old Town, where we continued our day on our own. We ventured through the Grand Masters Palace, walked through Hippocrates Square, adorned with an Owl Fountain, and then as we meandered our way through small streets lined with quaint shops, we passed by the Panagia tou Bourgou (Virgin Mary of Burgos), before reaching the promenade by passing through the Virgin Mary’s Gate. Just outside the gate is a small beach (where I dipped my toes into the Aegean Sea) and a lovely Dolphin Statue. We proceeded along the sea side back towards our ship. I honestly cannot believe all what we did in just one day, but it was fantastic! 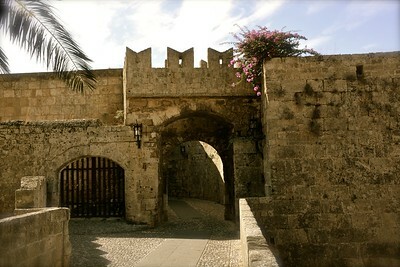 I would highly recommend Rhodes Private Tours. Nicholas and his team of drivers were absolutely fabulous! Once on board the Connie, we relaxed in our Suite prior to Dinner, enjoying an amazing sun setting over the Island of Rhodes.